Smartphones: What the Future Holds for Them? Today, billions of people in the world hold one or the other kind of smartphone and they have become very important devices in day-to-day use. Here Saima Paakkonen is discussing what could be there in the future of smartphones. The rate at which smartphone technology has progressed in recent years is simply incredible. It was not too long ago that a mobile phone was considered state-of-the-art if it included Snake, but these days our phones cater to our every whim. They are our communicators, advisers, translators, navigators – anything you’d care to mention. Not only that, but the vast array of technology on offer is usually packaged in a stylish, compact exterior casing. You might be forgiven, then, for thinking that there’s nowhere left for smartphone technology to go. You’d be wrong, though – very wrong. Even at the time of writing, there are several exciting new developments on the smartphone horizon, with some truly futuristic technology awaiting further down the line. In the short term, as processing power becomes better and more refined, we can expect better all-round performance from new smartphones. Battery performance is set to increase dramatically in the near future, thanks to new developments in power amplifiers expected to double the average smartphone’s battery life. It also won’t be too long before gamers are going to be able to make the most of their device, with graphics quality expected to rapidly catch up to consoles in the next few years. Improved camera quality is also likely to feature, with the emergence of models with built-in cameras that can compete with dedicated digital cameras. 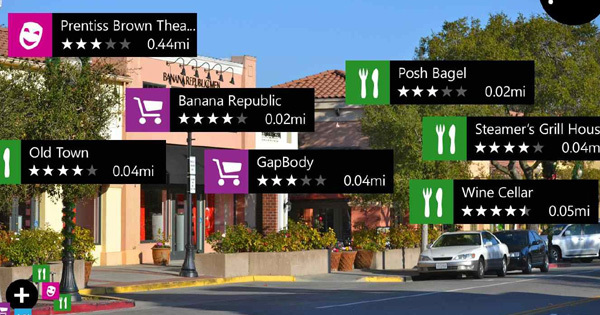 Augmented Reality (AR) provides information on things we see through a computer connected camera. Mobile devices are expected to become sleeker, faster and generally better at doing all the things they already do, then. But what about the things they don’t do (yet)? If we take a look at the more experimental side of the smartphone industry, we see a number of technologies that sound far-fetched enough to feature in the latest sci-fi movies, and yet some are already in development. Augmented RealityPerhaps most fascinating of all is the expected shift in focus towards so-called ‘augmented reality‘ (AR). Essentially, AR allows you to view an object or place in your environment (through your device’s camera) and superimpose information over the top. The potential for such technology is immense, not just in fields such as tourism and advertising, but most likely (as is usually the case with such things) in a few ways that we hadn’t even considered. Indeed, we have already seen AR begin to creep into the market recently, with new operating systems such as the Blackberry 10 featuring augmented reality apps. As well as changes to the way our phones interacts with the world, we can expect changes to the way we interact with our phones. Voice control technology, already fairly ubiquitous, is improving all the time, and soon will be good enough that we will be able to rely on it to carry out most functions (presuming touch input is not required). And for people who are tired of having to watch videos or view pictures on a miniature screen, there are already phones out there which feature built-in projectors. Although the technology is yet to be widely adopted, it is sure to be popular with mainstream smartphone users if it can be made powerful and affordable enough. Whichever way you look at it, the future of smartphone development is bright. With the combination of improvements to existing technologies and the introduction of several new ones, our mobile devices of the future will become our indispensable companions – even more so than they are now. Last updated: 23 September 2017 | Published on: 17 July 2013 | Authored and Edited by: Lalit Kumar and Team | Filed as: Home » Hardware » Mobile Phones » Smartphones: What the Future Holds for Them?